Valhalla Mountain Touring offers spectacular guided backcountry ski touring and snowshoe tours in the winter season. The terrain, which has Valhalla Provincial Park as its southern boundary, is extremely scenic and varied and can accommodate all ability levels. In the summer season guests hike to a variety of wildflower carpeted meadows and alpine ridges and peaks on good trails,. and can enjoy wildlife photography or viewing with frequent mountain goat and eagle sightings on the way to beautiful alpine and sub alpine lakes Mountain biking combined with hiking is also possible. Our lovely timber frame Ruby Creek Lodge with hot and cold running water, flush toilets, and sauna and shower keep guests comfortable when they are not out and about. A small hydroelectric power system provides lights and some heat. Fourteen people can be accommodated in six bedrooms. 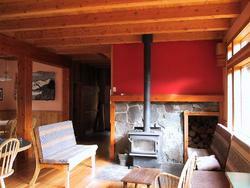 VMT ‘s Ruby Creek Lodge is a wonderful place to have a retreat, workshop or family reunion.